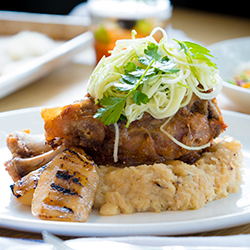 For a meal to enjoy on a chilly fall night in Oakland, look no further than our Cracklin' Pork Shank. This dish features seasonal ingredients such as sauerkraut bacon mashed potatoes, poached apples, and Serrano applesauce. We recommend pairing it with a glass of Boxhead Shiraz. 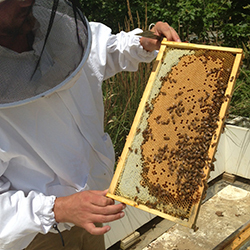 Did you know that our rooftop has 4 bee hives containing 400,000 honey bees?! Our bees produce about 120 pounds of honey each year that we use in many of our specials. This past summer, we even partnered with Millie's Homemade Ice Cream to create an exclusive flavor that used our own honey! It was called Chocolate Bee Hive and was only available here at The Porch! Looking for the perfect place to host your special event? Whether you're hosting 20 or 220 people, we're here to make it a memorable experience. 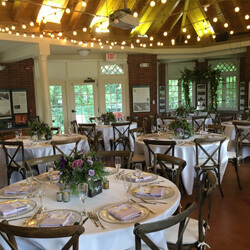 We provide catering at the nearby Schenley Park Café and Visitor Center, or you can book our restaurant for a private rental. Our menu is an eclectic mix of the familiar & surprising…creative new recipes as well as classics with a twist. By teaming up with partners like Penn’s Corner Farm Alliance, Wild Purveyors and others, we’re able to build our menu around seasonal, local ingredients. We keep an annual garden on our rooftop, so that we can use fresh-picked herbs and produce in our kitchen everyday. It’s also home to several beehives, which means honey is never in short supply. 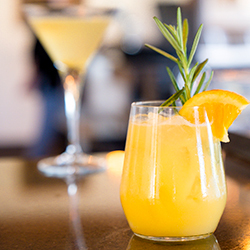 Pause and reconnect with friends over a scratch-made meal and a drink on our porch. With the best outdoor dining in Pittsburgh, the views are nearly as good as the food.